The 2017 Walk for Justice was a great success. Held annually on National Pro Bono Day, this year’s event took place on 16 May in Queensland, South Australia, Victoria and Western Australia. 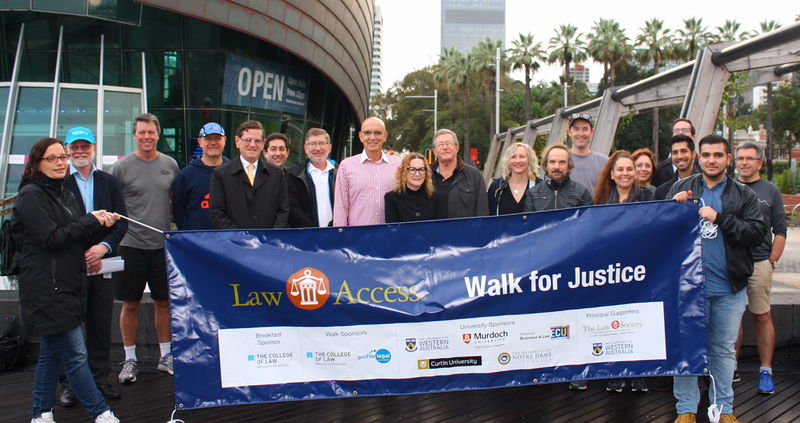 Despite a slight drop in numbers overall (1,708 walkers compared to almost 1,900 in 2016), the event has already raised a record $173,299 for LawRight, Law Access WA, Justice Connect and JusticeNet SA, up from $157,000 in 2016. As these figures demonstrate, the Walk continues to raise the public profile of the significant work undertaken by pro bono clearing houses and referral schemes around the country, and is an excellent opportunity for the sector to come together and celebrate the pro bono efforts of the legal profession. 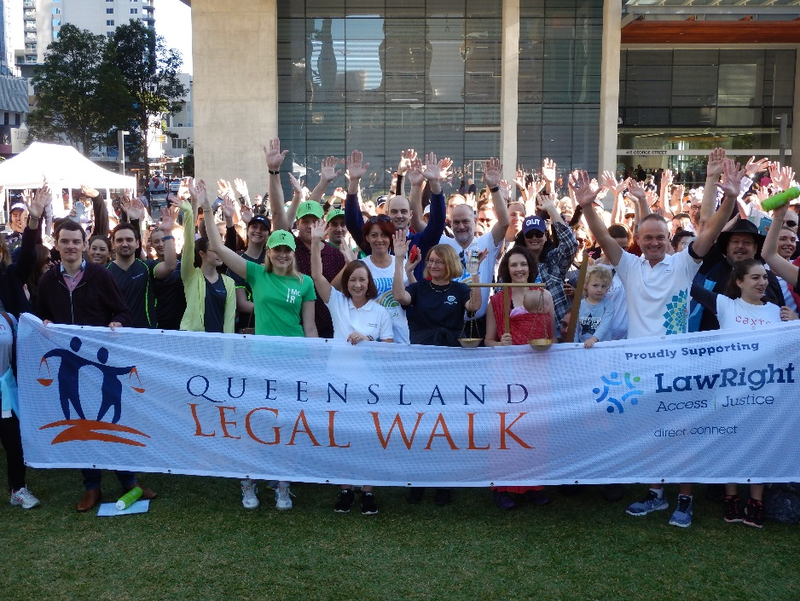 In Queensland the walk is called the Queensland Legal Walk and was supported this year by over 700 walkers in Brisbane, Cairns, Gold Coast, Sunshine Coast, Toowoomba and Townsville. The Impressive $80,000 raised will help LawRight continue its work in assisting the most disadvantaged in the community. 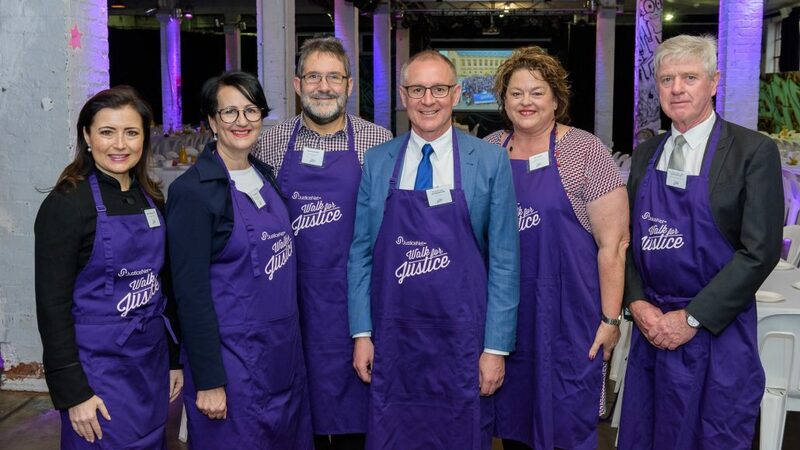 Congratulations to this year’s ‘Justice Cup’ Winners, the team from North Quarter Lane Chambers, who topped the fundraising team leaderboard for the fourth year running; and Chloe Sheptooha from Clayton Utz, the top individual fundraiser. Walkers in Brisbane, Sunshine Coast and Cairns, including the Hon. Catherine Holmes (Chief Justice of Queensland and LawRight patron), the Hon. Yvette D’Ath MP (Attorney-General, Minister for Justice and Minister for Training Skills), the Hon. Andrew Wallace MP, His Honour Judge Gary Long SC, Bill Potts (Queensland Law Society Immediate Past President) and Christine Smyth (Queensland Law Society Current President). The Brisbane event was again led by the Hon. Catherine Holmes, Chief Justice of Queensland and LawRight patron, and the Hon. Yvette D’Ath MP, Attorney-General and Minister for Justice and Minister for Training Skills. The Legal Walk on the Sunshine Coast, organised by the Suncoast Community Legal Service, attracted over 28 walkers, including the Hon Andrew Wallace MP (a former barrister) and His Honour Judge Gary Long SC. In Cairns, the event was attended by around 20 percent more walkers than last year, including Bill Potts (Queensland Law Society Immediate Past President), Christine Smyth (Queensland Law Society Current President) and the entire Far North Queensland Law Association committee. Thirty-one walkers participated in the Toowoomba Legal Walk, including Judge Nicole Kefford. Sixty walkers took part on the Gold Coast, including two Domestic Violence Specialist Court Magistrates (Magistrate Colin Strofield and Magistrate Barbara Tynan) and two Southport District Court Resident Judges (Judge Katherine McGinness and Judge Catherine Muir). In Townsville, 45 walkers were led by northern judge of the Supreme Court of Queensland, The Honourable Justice David North. The Mackay District Law Association also hosted a breakfast in Mackay to help raise funds for LawRight. Law Access WA Walk for Justice Ambassadors. (L-R): Katrina Williams, Principal Lawyer, Law Access; Michael Cole, Executive Director, College of Law; The Hon. Justice Richard O’Brien of the Family Court of Western Australia; Matthew Howard SC, President of the Western Australian Bar Association; The Hon. Robert French AC; Alain Musikanth, President of the Law Society of Western Australia; Chief Judge Kevin Sleight of the District Court of Western Australia; The Hon. John Quigley LLB JP MLA, Attorney General; The Hon. Jennifer Smith, Acting President of the Western Australian Industrial Relations Commission; The Hon. Wayne Martin AC, Chief Justice of Western Australia; Genevieve Cleary, President of the Criminal Lawyers’ Association of Western Australia; Professor Doug Hodgson, Notre Dame Law School; William Sloan, Vice President of the Family Law Practitioners of Western Australia; Associate Professor Natalie Skead, Dean and Head of School, UWA Law School; Paula Wilkinson Director, Law Access; Adam Ebell, Chairperson, Law Access; Matt Keogh MP (partially obscured), Director of Law Access; Assel Dawood, UWA Law Student volunteer; John Cordery, Provost, Curtin University. The second annual Law Access WA Walk for Justice saw a 60 percent increase on last year’s participants, with 350 people raising over $28,538 to help support Law Access WA. Together with the Hon. Robert French AC and 14 other eminent Event Ambassadors, the Hon. Wayne Martin AC (Chief Justice of Western Australia) led the walkers from the Bell Tower at Barrack Square to Point Fraser and back. The Hon. John Quigley LLB, JP, MLA, Attorney General of Western Australia also joined the walk, demonstrating his support for the important cause. Breakfast following the Walk was sponsored by the College of Law Western Australia. WA Top Fundraising winners. (L-R): Adam Ebell, Chairperson of Law Access; The Hon. Jennifer Smith; Zemyna Kuliukas, President of Curtin Student Law Society; the Hon. John Quigley LLB, JP, MLA Attorney General; Whitney Corfield; Catherine Berbatis of Minter Ellison). Congratulations to the top individual fundraiser in WA, the Hon Jennifer Smith, Acting President of the Western Australian Industrial Relations Commission. The Minter Ellison team won the top fundraising team trophy, while Curtin Student Law Society won the top fundraising student team prize for the second year running and Whitney Corfield, a Curtin Student Law Society team member, was the top fundraising student. 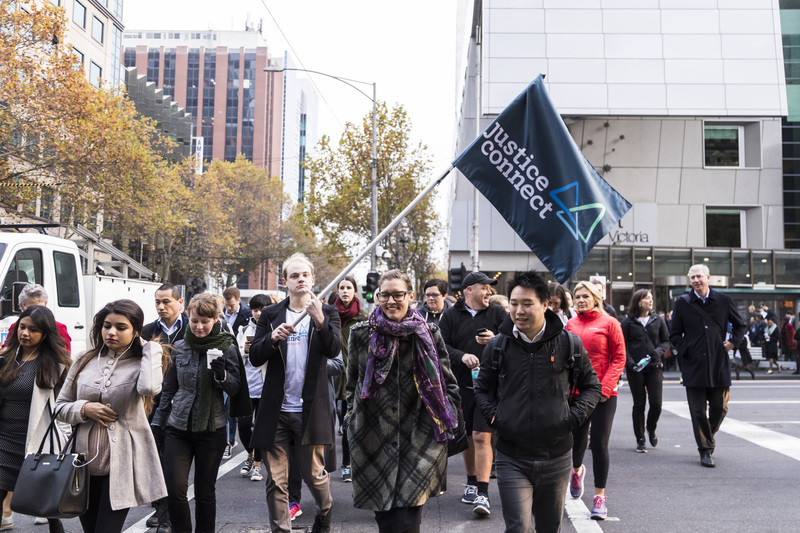 This year, Justice Connect and the Law Institute of Victoria re-launched the Walk for Justice in Victoria, with 192 walkers in Melbourne and, for the first time, Geelong. Walkers were encouraged to kick off the 25 friends x 25 dollars campaign run by Justice Connect, which will continue throughout the year in recognition of Justice Connect’s 25th anniversary. So far, the campaign has raised $8,730, which will go towards Justice Connect’s work in supporting those who are (or are at risk of) experiencing homelessness, older people facing elder abuse, asylum seekers and refugees. 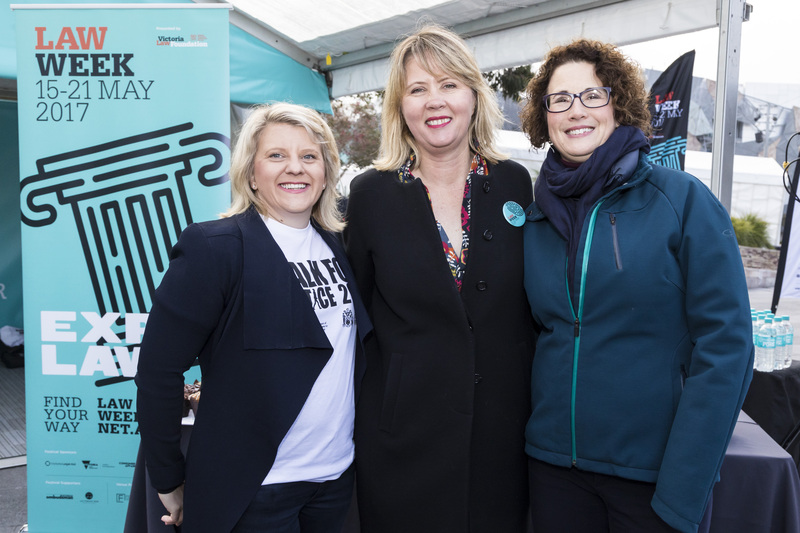 (L-R): Belinda Wilson, President of the Law Institute of Victoria; Joh Kirby, Executive Director of Victoria Law Foundation; and Fiona McLeay, CEO of Justice Connect. The Melbourne Walk began at the County Court forecourt and finished at the Law Week festival hub at Federation Square. Walkers included the Victorian Attorney General, Martin Pakula; Justice Marilyn Harbison, Vice President of the Victorian Civil and Administrative Tribunal; Serina McDuff, Executive Officer of the Federation of Community Legal Centres; Bevan Warner, Managing Director of Victoria Legal Aid; Fiona McLeay, CEO of Justice Connect; Joh Kirby, Executive Director of Victoria Law Foundation; and Belinda Wilson, President of the Law Institute of Victoria. Our CEO, John Corker also attended the Melbourne Walk on behalf of the Centre. 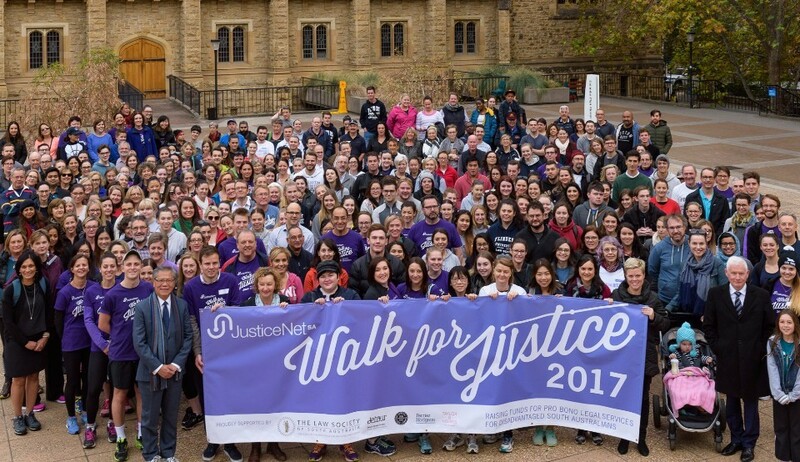 JusticeNet SA hosted another successful Walk for Justice in South Australia, with 466 walkers and other donors raising a record $56,031 to support JusticeNet’s work helping those experiencing poverty, disability, risk of homelessness, refugees and people representing themselves in court. 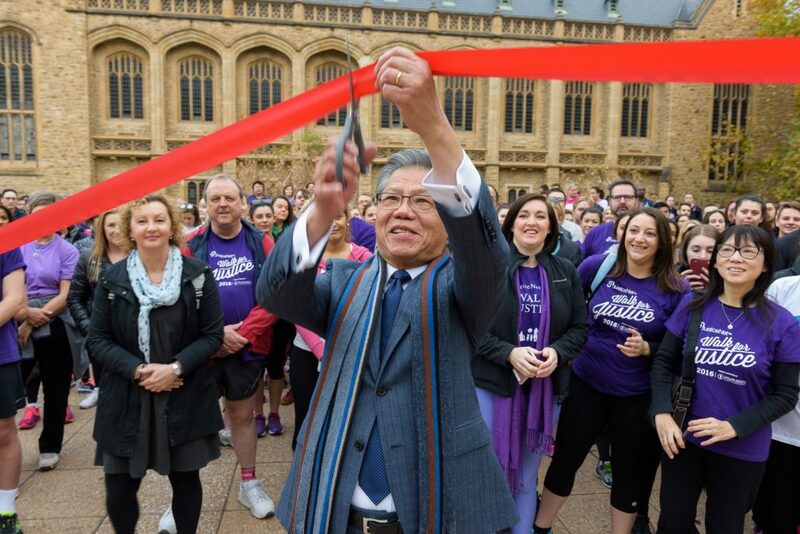 The walk was opened by Deputy Premier and Attorney-General John Rau, and His Excellency Governor Hieu Van Le AC cut the ribbon. His Excellency Governor Hieu Van Le AC cutting the ribbon. 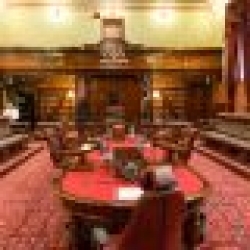 Following a walk along the Torrens, breakfast was served at the Published ArtHouse by the “Breakfast Club” led by Chief Justice Chris Kourakis QC. Congratulations to Lipman Karas for winning the Walk for Justice Cup as the highest fundraising team and to Ruth Beach, the highest individual fundraiser. 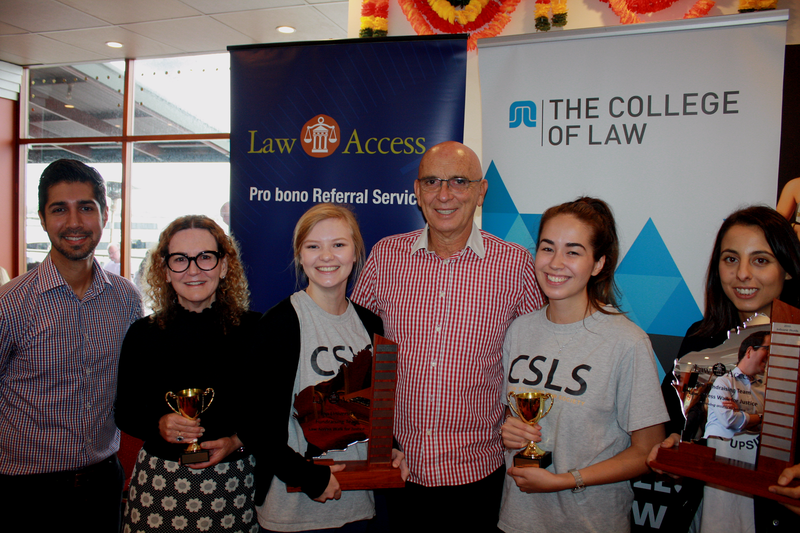 The Walk for Justice Shield was presented to the highest fundraising university team, Adelaide University Law Students. The Breakfast Club at the Walk for Justice in Adelaide (L-R): Rachel Sanderson MP, Member for Adelaide; Vickie Chapman MP, Member for Bragg; Mark Parnell MLC, Greens Member of the Legislative Council, South Australia; Premier Jay Weatherill, Premier of South Australia; Nat Cook MP, Member for Fisher; His Honour Chief Judge Michael Evans, Chief Judge of the District Court. (Not pictured: The Hon. Chief Justice Chris Kourakis QC and The Hon. Steven Marshall MP, State Liberal Leader).